Michael Stephens sits in a wheelchair near the corner of Achilles and Auer streets in Milwaukee’s Harambee neighborhood. These days, Stephens doesn’t have either of his legs, but that doesn’t seem to trouble him, too much. 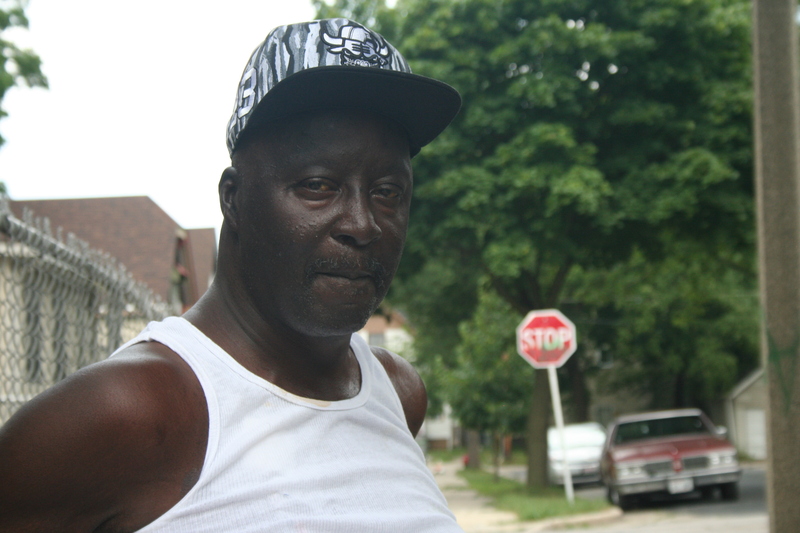 Stephens grew up in Chicago, which he called “real rough.” On top of it, he has seven sisters and four brothers. Michael, who was the sixth child — right about in the middle — refers to himself as the “black sheep.” He says he was always getting in trouble because he didn’t get very much attention. Stephens says he wanted to make a career out of dancing and acting, but “it kind of fell apart” and he eventually lost interest. While in the boy’s home, though, he discovered another passion: English. School became a pleasure for Michael — well, that is, everything but social studies. While at DuSable High in Chicago, he discovered a love for Algebra, as well. He even made it on the honor roll a couple times. “I [was] just excited about school,” he says. After he graduated, Stephens went into the service. Enlisting allowed him to travel all over the country, and even around the world. He did basic training in Missouri, spent time in Indiana and eventually found his way to Fort Ord in California. From there, he went to Germany and spent some time in Paris, as well. “After the service, I came back here — that’s why I met Eddie,” says Michael, referring to his partner of 38 years. The doctor diagnosed Stephens, whose grandmother was also diabetic, with the disease. The doctor’s advice to Michael was to adopt healthier eating habits and exercise more. Though Michael doesn’t have any children of his own, that doesn’t mean he doesn’t like them. “I love kids — I love kids,” he says. Stephens has “a whole bunch of nieces and nephews.” He lived with his little sister for some time, as well, and helped her raise her kids. He also has a “gay daughter,” whose children he considers grandchildren. “They call me grandpa,” says Michael proudly. When Michael lost his legs, it was that love that helped him through the experience. Did you find value in Michael’s story? If so, please subscribe to our newsletter; we publish the story of a different Milwaukeean every week.